I have been so completely intrigued by Rita's brilliance with the half square triangle that I have been inspired to have a go myself. The great thing about HSTs is the amazing variety of layouts you can choose. I'm usually an incredibly lazy sewer but with this one I even trimmed my blocks!!! I finished up the quilt top on the weekend. The fabrics are mostly from my stash but the grey is a thrifted flat sheet from the oppy!! The blocks are 6 inches cut (5.5 inches sewn). The quilt is 14 blocks squared so (quick calculation .....) 77 inches squared. 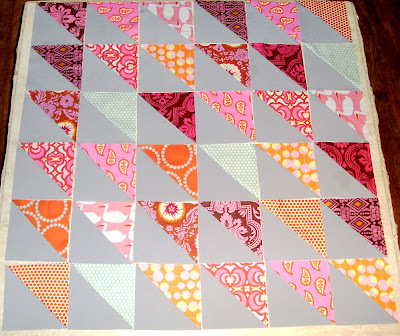 I'm planning to hand quilt this one with lots of different coloured threads (to match the fabrics) in the grey areas. Thanks to Kate for that great idea!!! See you VERY soon with my first blogiversary giveaway. Wow! I love it! Especially the layout you chose. Gorgeous! Really love the layout you went with. It'll look amazing. 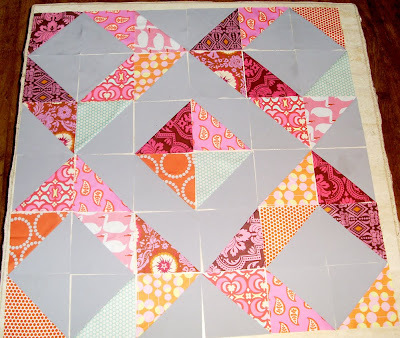 That is stunning - I love the quilts you can achieve with half square triangles! It's fabulous and I love it, very sparkly looking. It's going to great with the quilting you have in mind. Hey I get it. 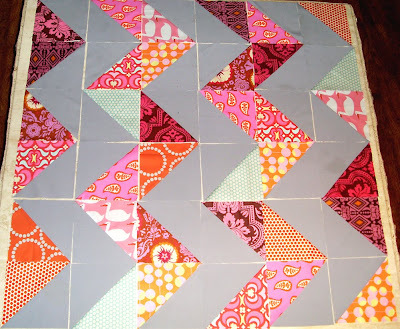 Instead of blogtober you're playing quiltober! All those layouts look great! Love all your layouts! I have big plans for all the charm packs I've collected. HST's and Ikea flat sheets. I read in a popular blog (can't remember right this minute), that their flat sheets are great for sashing. it is soooo beautiful! can't wait to see it quilted with all those threads...what a great idea! Wow Andi! So happy to have inspired you!! The layout you have chosen looks fantastic. I love the grey background fabric, but even more so because it is recycled. Did you find it easier to piece the blocks together having trimmed them? Thanks for the links to my blog, much appreciated. It's lovely. I am so liking the gray lately. I just cut a bunch for my little guy's quilt to do this design. Love the idea of the thread! That is amazing!! I don't quilt ( I have tried though) and am constantly amazed at the beauty and creativity out there in the quilting world. OHMYGOSH! Andi, another GORGEOUS quilt. That cool grey looks smashing with your print fabrics. I like the sound of your quilting plan too!! Oh, and did you say we can win this quilt in your blogiversary giveaway? Gosh, that's soooooooo nice of you. 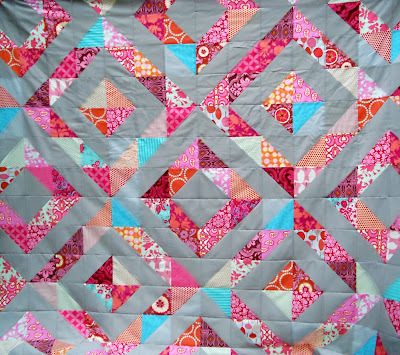 ;-) Lovely quilt! It is wonderful! I love how the gray brings out the colors. Gorgeous hst's I love the layout you chose, and grey, fantastic, I would never have thought of that! This gives me an entirely new perspective on the HST possibilities. The grey really sets the whole thing off very nicely. I was going to say how much I loved the grey/pink/orange combo and then you threw in that turquoise. Totally in love now. The quilt looks great! Love the playing with arrangement!